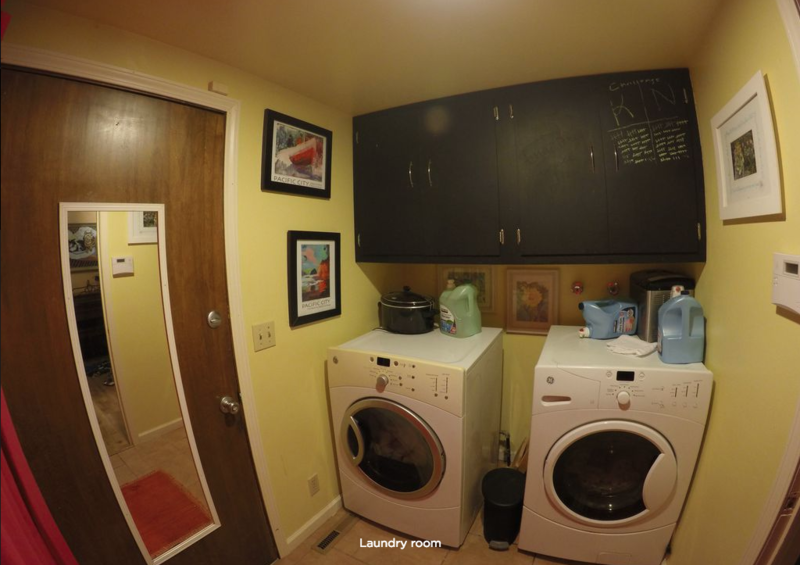 One of the biggest updates to our house has been a complete re-do of the laundry room. That might seem like an odd place to focus energy on, but the original space was essentially a hallway on the way to the garage. It was too small, yet somehow had a lot of wasted space. So as part of the renovation we moved the wall between the laundry room and guest suite by about two feet, significantly enlarging the laundry room. We moved the doorway as well, so the area has a much better flow. 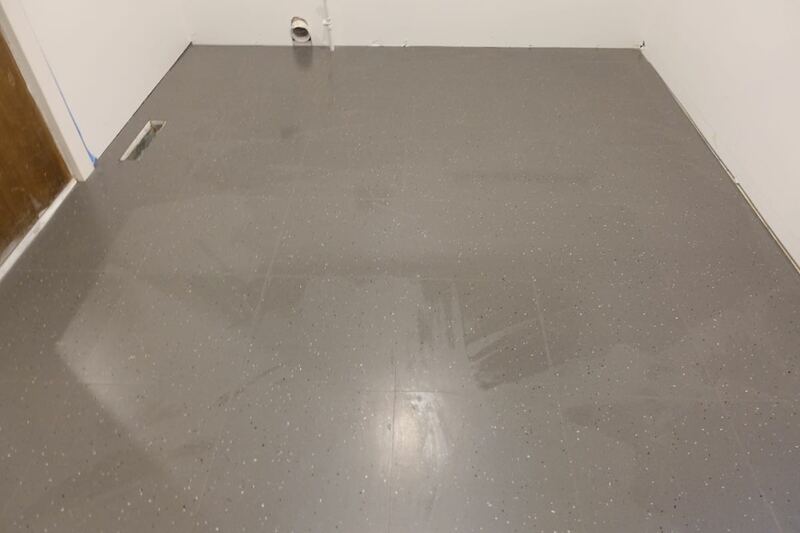 We’ll have full details of those changes in a future post (we’re still installing cabinets and countertops), but in this post I want to talk about the floor. Since we’d enlarged the room we obviously needed to replace the flooring, though honestly we’d have wanted to do that regardless, as the original floor was a terra-cotta colored laminate that didn’t match anything in the house. We wanted something that would stand up to the high traffic coming in and out of the garage, but would also be more period-appropriate. In the end, we chose a vinyl composition tile. VCT has evolved beyond what you’ve seen in elementary school cafeterias and car dealerships, and is becoming a trendy option for mid-century restorations in California. In fact, if our house were in Palm Springs I would have no qualms about installing VCT in the main areas of the home instead of hardwood, but that seemed a bit risky for the Spokane market. In the laundry room, however, VCT seemed like a perfect option. 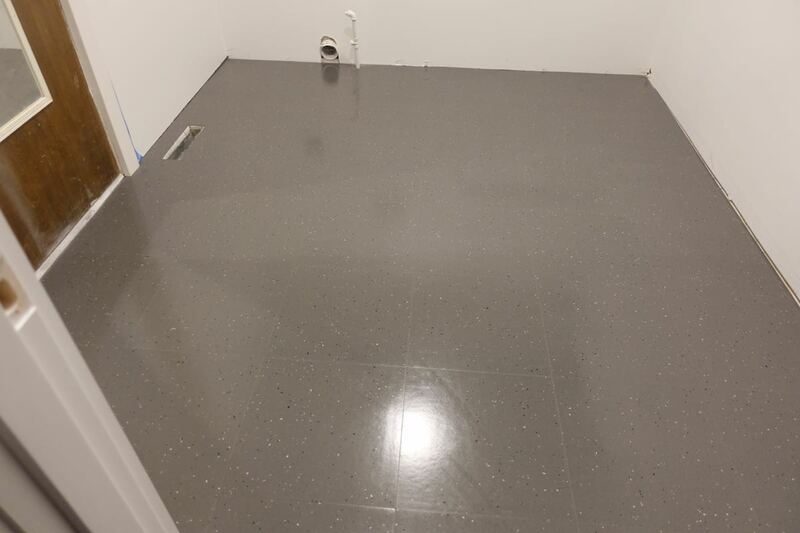 We looked at dozens of different options — most commercial flooring stores stock VCT, and Home Depot and Amazon sell vinyl composition tile as well — and settled on a speckled grey 16″ square solid vinyl tile. This particular tile (Azrock Cortina Grande in Loam) was a bit hard to find in stores, and was way more expensive than 12″ options, but we really liked the color and the larger squares. I ended up finding it on FloorCity.com for a bit under $4/sqft. We could definitely have installed this ourselves, in retrospect. The hardest part was prepping the floor, as it has to be completely level and smooth for the glue to work properly, but our tile guys made short work of the install — I don’t think it even took them an hour. Once everything is installed and the glue has set, VCT has to be cleaned (some brands come with a protective coating from the factory that has to be stripped, a good cleaning was fine for ours), then sealed. You can repeat this as often as necessary to keep your tiles shiny, but doing it the first time is especially important. I was super intimidated by the idea of sealing VCT, but as it turns out it is some of the easiest mopping you’ll do in your life. 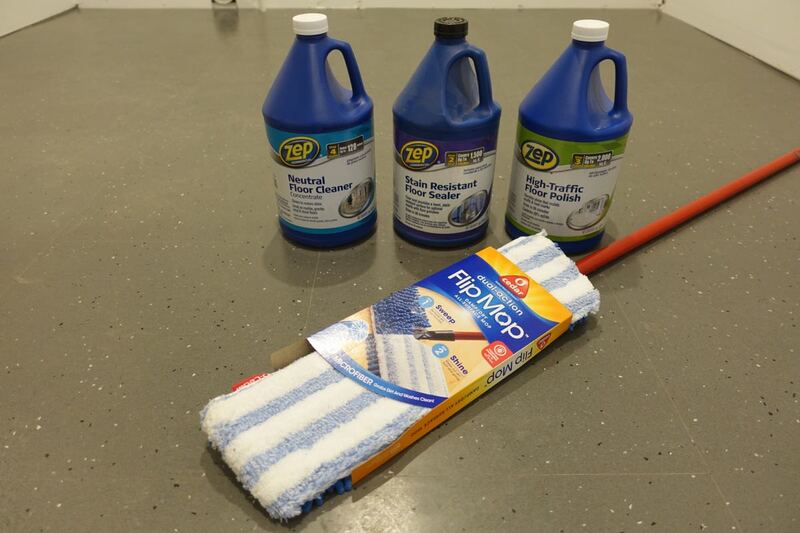 We vacuumed the floor thoroughly, then following the dilution instructions on the back of the bottle, mopped the entire surface with the PH-neutral cleaner. We cleaned twice, for good measure. 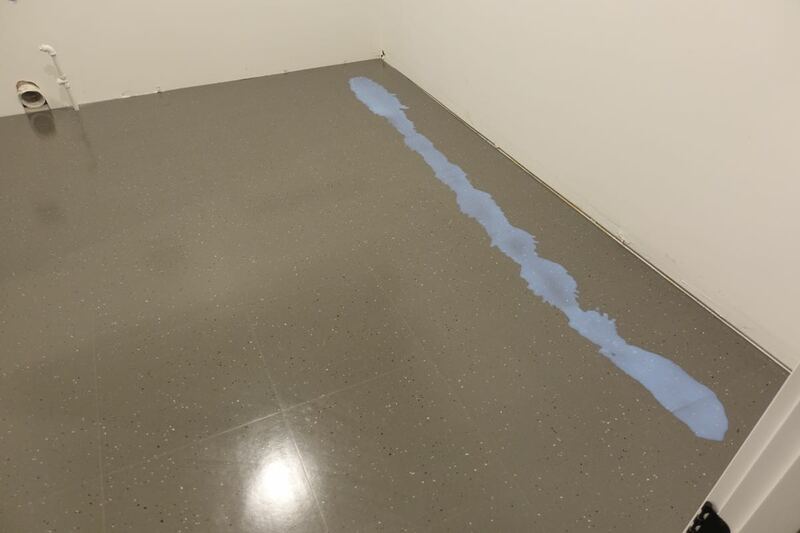 Once the floor is clean and dry, apply the sealer, working in sections. You can pour this out and push it around, just be careful not to apply too much at once. Everything has to dry between coats, and we did two coats of sealer. But each coat only took about five minutes to apply and an hour to dry, so it wasn’t too bad at all. The number of recommend polish coats varies based on where you’re using your tile, and how shiny of a look you’re after. We did four coats, which were applied in the same way, with plenty of drying time between coats. 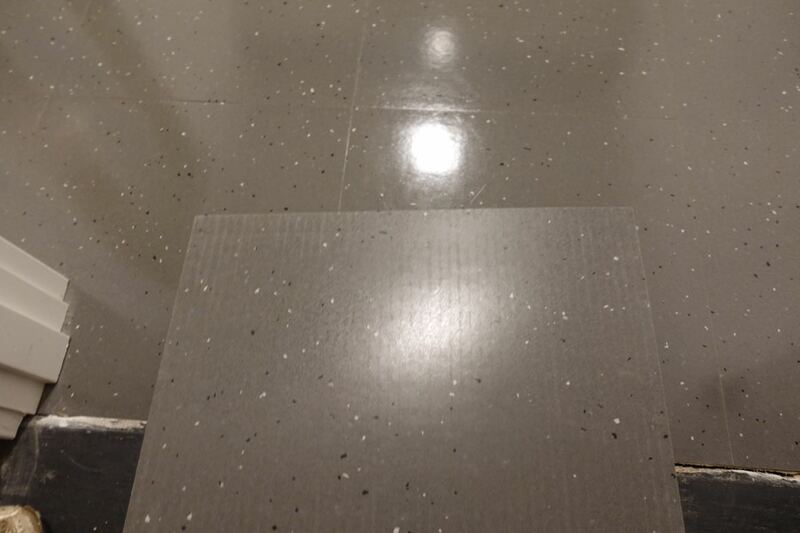 As a comparison, here’s an uninstalled tile next to the finished and polished floor. You can see what a difference the cleaners and polishes make on the look of the tile! So far I’m super happy with the choice of VCT in the laundry room. Retailers here where skeptical when I asked about purchasing it for residential use, but it’s really the perfect material for a high-traffic laundry/mud-room. We expect that we’ll have to clean and re-polish the tile every six or so months, or at least after each winter, but in general it’s holding up wonderfully.